Projects and Plans This is the list of Portland's transportation Projects which PDOT believe's are the most important . CIP Projects and the cost of each project under construction! 4. We're paving over America. 5. We can't deal with global warming unless we stop driving. Just How Bad Is Sprawl? Purchase feeds hope to MLK The (PDC) urban renewal agency bought the property for $1.75 million in 2000 and sold it for 1.2 million!! Tax break rankles in tight times Portland Mayor Katz and city council gives tax breaks to a $840,000 Pearl District condo that pays only $146 a year in property taxes. A better Burnside could be ours --for $61 million More pork projects for downtown Portland, paid for by the suburbs! Urban renewal takes money that would have gone to police fire and schools. Cities should not condemn private Property for a developer! If successful, the Public Storage site would be the redevelopment agency's fifth condemnation action this year. Living in a dense urban center is noisy and it generates lots of noisy garbage trucks. Notice -- More people and businesses and residents = more noise! The analysis says the Opus project needs a $6 million public subsidy. Designing a district The possibility of a Home Depot in the Central East side raises larger questions Planners and social engineers try to keep Home Depot from opening a new store. One of Portland favorite examples of Smart Growth is having a problem with crime and retaining business. Most of Hawthorne was built before Portland's Smart Growth Policies. with the rest coming from fares, advertising and the new parking meters in the River District. Portland paid $906,000 for 2004 this year. The streetcar is not sustainable! A slide show including Interstate Max counts before and after the train is built. times the increase in passenger usage. Bikes and the STIP Click Here where does my transportation taxes go? Possible city could be model of urban growth NOT! Portland's history of losing money on baseball, the water district, sewers and performing arts, the street car line etc. should end the discussion of running parking. The PDC spent $12 million on renovations and $1.7 million for a seismic refit. The PDC was losing about $120,000 a month. This project is one of many examples of how Portland diverts property tax revenues from schools, police, fire and social services to the PDC. The PDC uses the money to add density and support what they call smart growth project. As we all know it is easier to gamble and fail with taxpayers money. Mixed land use; mixed opinions Who should decide how property should be zoned? The property owners or government planners? Is M&F ready to bolt from downtown? This longtime Portland Landmark is not drawing customers like the popular M&F Mall stores. Shoppers seem to be attracted by Parking and shopping closer to where they work and live. The mayor and city council have been talking about giving tax breaks to keep the department store at it's present location. This store is located next to light rail. American dream proves elusive This is an example of planners and Smart growth supporters driving up home prices up, then giving tax breaks to some buyers . PDC chief takes the offense Elected and government officials claim it's a urban myth that Portland is unfriendly to business. Many Business think the statement is a joke and not accurate. Parkrose activist Craig Flynn's views are reflective of those concerns. The Portland development agency, he says, is "the fastest growing government in the city, and it's a government we don't elect, and it's appointed by the mayor, but she doesn't have total control," he complains. "They're letting this government agency run wild." I thought the city was broke ! $188,400 for planning for a restaurant? Oregon's land use planners and government agencies are in a panic. They have been treating citizens like Dorothy English as if they had no right to the property they bought under the rules of the county, city and state. Planners rezoned properties without permission of the owners and expected them to go along for the ride. Even if it made it impossible to build a home or use the property the way it was zoned when they bought it. Planners were not concerned if they took value or rights from property owners in the past. 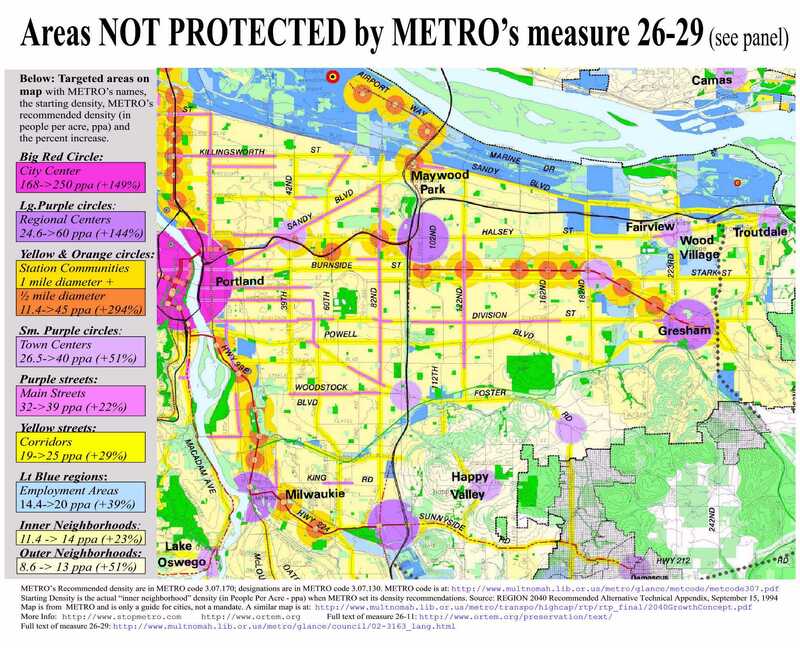 That has all changed thanks to voters passing Measure 37. Hurdles face Mill Creek project $30 million of state and city taxes to subsidize this project! Lack of Parking, hurts business and churches in Portland. Katz plans way out of mural mire Is this really about collecting a $1,400 mural tax! Calling all hotels to 'fork it over' Metro to recycle food for the hungry! High taxes are driving old established businesses away, while new business get tax incentives to move to Portland . Obesity and Life Styles: Is it the Hamburger or your House? by Ronald D. Utt, Ph.D.
Metro council voted to spend $54.2 million in federal funds. 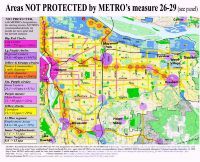 "Trouble in Smart Growth's Nirvana"
the measure does not change the density mandate, it just moves it.